We have basic colors (listed below) and can accommodate special custom colors for an additional charge. We can powder-coat new or used springs. Springs need to be in good condition and clean. There will be additional charges to clean and prep used springs that are in poor condition. Cleaning Fee - $25 for dirty used springs that are otherwise in good condition. Strip Blasting Fee - $65 used springs that are too rough and need to be stripped. Note: Most RT Dual Shock Springs are black. 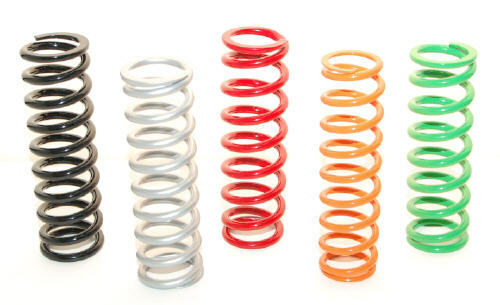 Most RT Single Shock Springs are blue.